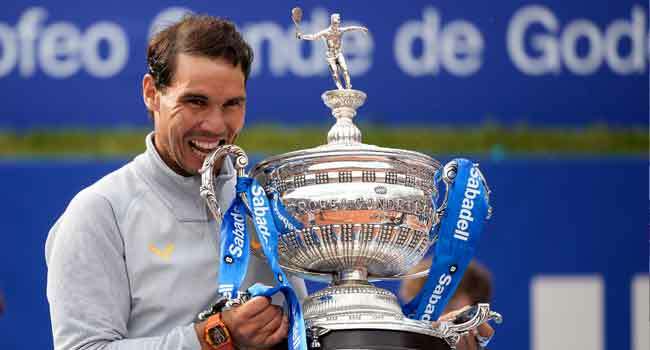 Rafael Nadal won his 11th Barcelona title on Sunday when he breezed past Greek teenager Stefanos Tsitsipas 6-2, 6-1, reinforcing his position as the overwhelming favourite to lift an 11th French Open. It was world number one Nadal‘s 55th career clay-court title while he also extended his winning streak on the surface to 46 consecutive sets. The 31-year-old Spaniard won his 11th Monte Carlo Masters last weekend, also without dropping a set. Nadal now has 77 titles overall while his career clay-court match record stands at 401 wins against just 35 defeats. “It’s very difficult to describe how to win 11 titles at one tournament. To win 11 Monte-Carlos and 11 Barcelona is something I couldn’t imagine doing. I’m just enjoying every week and the fact I’m playing in a tournament that I enjoy so much means a lot to me,” said Nadal. His win on Sunday was greeted by ticker-tape and a video review of all his titles on the center court in Barcelona which now bears his name. “It’s really emotional to see that video. I never dreamed of having a career like this,” said the 16-time Grand Slam title winner. “Last year, they made a video of my 10 titles here. Now they have had to make another video for 11 — it makes me feel like I am ageing. Nadal is now level with John McEnroe on 77 career titles with only Jimmy Connors (109), Roger Federer (97) and Ivan Lendl (94) ahead of him. He may not catch them but one thing is for certain — barring injury, he is more than likely to be lifting an 11th ‘Coupe des Mousquetaires’ at Roland Garros in Paris on June 10. His confidence of capturing a 17th major will be boosted by seeing his ‘Big Four’ rivals falling by the wayside. Roger Federer is skipping the clay season for a second successive year to concentrate his assault on a ninth Wimbledon title. Novak Djokovic is struggling to recover from an elbow injury and Andy Murray hasn’t played since last year’s Wimbledon and underwent hip sugery in January. Tsitsipas, 19 years old and ranked 63, was the first Greek man to make an ATP final since Nicholas Kalogeropoulos in Des Moines back in 1973. He was also the youngest Barcelona finalist since Nadal in 2005. “Stefanos, you had an incredible week. You have a great future and I wish you great success,” added Nadal of an opponent who will become just the second teenager in the world top 50 next week after Canada’s Denis Shapovalov. Nadal needed just 77 minutes to claim victory on Sunday. After racing through the opening set, he was quickly 3-0 up in the second before Tsitsipas carved out a degree of hope in the fourth game when he had two break points. They were quickly saved by Nadal who then claimed the title on a third match point in the seventh game when the teenager dumped a one-handed backhand into the net. “I have seen millions of Rafa’s clay matches on TV — I have been preparing for this match for 10 years,” joked the young Greek.